Barrie Hobkirk with his Scrapper at the 2012 Combat Graffiti event in Richmond, B.C. Marty Higgs photo. Long ago it must be, I have a photograph. Preserve your memories, they’re all that’s left you. 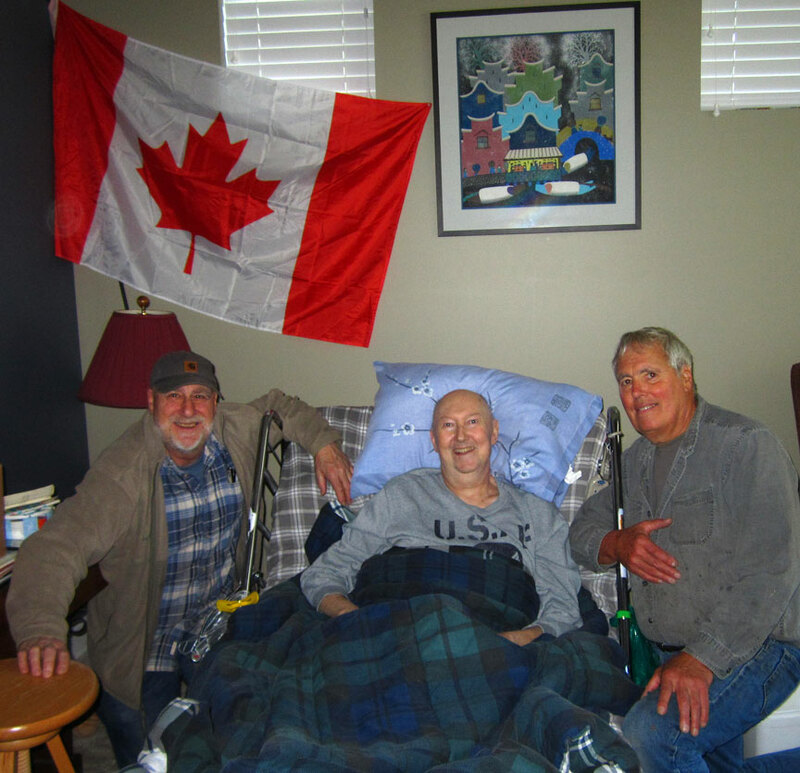 Barrie Hobkirk passed away Jan. 27, 2019, ending his long, painful and hard-fought battle with a cancer that he could not beat this time. After seven months spent in the hospital, they told him the treatment would kill him if he continued, and he came home in June. He was born in Vancouver, B.C., and the Hobrirk family later moved to the United States. His father had immigrated to Canada when he was a young man hailing from Scotland. Sometime in the 1950s, they moved from California back to Vancouver B.C. I met Barr when I was 16 and we were flying events at the Vancouver Gas Model Club Internationals. You know a good friend when you meet one, and we hit it off right from the start. 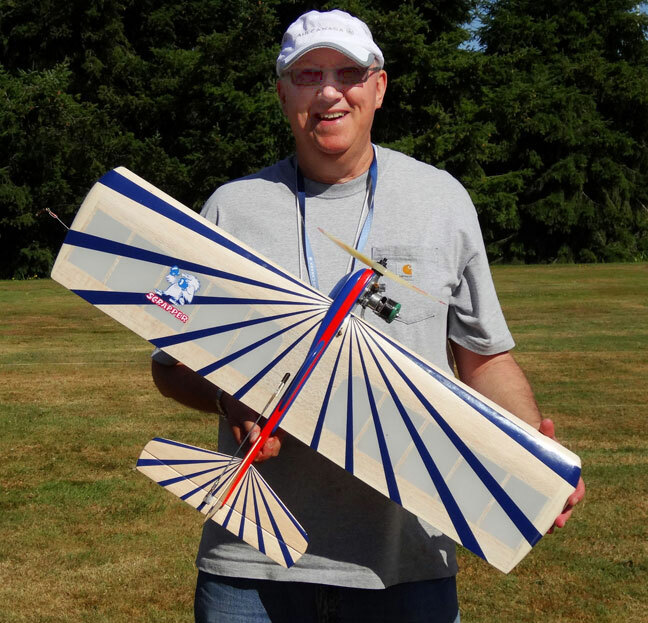 In the model airplane world, Barrie was known for his master craftsmanship. At 17 he built a scale model Spirit of St. Louis that won both in the U.S. and Canada Nationals. The model was a perfect scale using cable-actuated controls like the full-scale aircraft. He somehow made gauges that functioned from crankcase pressure. Barrie also built a tuned pipe in high school and his own rear-exhaust engine. He ran it, the piped worked and he received the top grade. In the speed circle, Barr flew 1/2A speed with his own three-port TeeDee .049. He made a slug, brazed it to the liner and used the space to create the third port. He held many speed records with his 1/2A Pink Lady. Barrie was also a world renown expert on antique Maserati open-wheel race cars; he could authenticate any part of, or a complete car from one that was a black-market fake. Throughout his illness, he never lost heart, we spoke on the phone a few days before he died and told me he had talked his wife into going to the store to get ingredients to make bean dip. Barrie loved to eat. I’d love to share the personal things, the fun we had, but maybe another time. 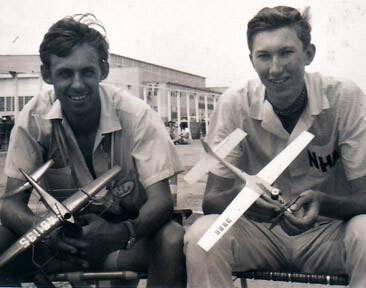 Barrie Hobkirk (right) with a 1/2-A Speed plane in his youth. That's Chris Sackett on the left. Photo submitted by Ken Burdick. Barrie Hobkirk flanked by Ken Burdick (left) and Greg Davis in October 2018. Mable Hobkirk photo.